Meet Gannon. He’s our official 2019 Miracle! 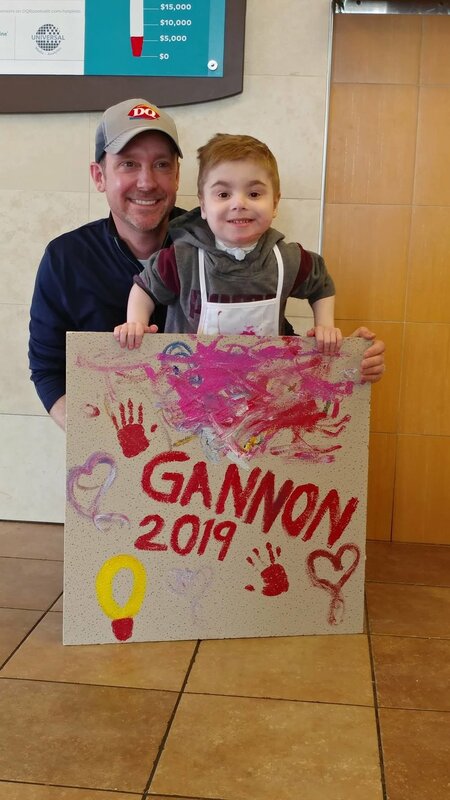 Gannon came to DQ Roosevelt this year as our official 2019 Miracle Child of DQ Roosevelt. He painted a ceiling tile to put his amazing personality in our store forever! Loves the Philadelphia Eagles, Buzz Lightyear and Woody from Toy Story, and French Fries! Gannon was delivered by emergency C-section on December 11, 2013. When Gannon was born he was 12 weeks premature and weighed only 13 ounces. Gannon was transferred to Penn State Children’s Hospital by a pediatric ambulance for a Tracheostomy. The doctors did not think he would survive, but he did earning him the nickname “Warrior Gannon, Jr.”. After spending 225 days in the NICU he was allowed to go home. Today “Warrior Gannon, Jr.” continues to defy the odds and is a thriving 5 year old little boy. Meet Madeline. She's a Miracle! The 2018 Official Miracle Child of DQ Roosevelt! Life can change in an instant. It certainly did for Madeline. On October 27, 2015 Madeline’s babysitter accidentally forgot to put Madeline in the car and backed the car over her. Madeline was flown by Life Lion to Penn State Children’s Hospital where she was diagnosed with lacerations to her lungs, kidney, and liver and multiple pelvic and foot fractures. She spent eight days in the Pediatric Intensive Care Unit. After just a few days at home, she was readmitted for an infection and needed a chest tube placed to receive antibiotics. Today, Madeline is doing well! She is back to walking and jumping and no longer needs physical therapy. She loves Sesame Street, especially Cookie Monster. She is so excited to participate in 2018 Blizzard Run. Madeline loves Blizzards – M&M Blizzards are her favorite. Madeline is proof that accidents happen, but so do miracles! Donations to Children’s Miracle Network support equipment, research and programs to give kids like Madeline the #GiftofGrowingUp. Thank you! Meet Corbin. He's a miracle. Corbin Hutchison was born with an underdeveloped diaphragm causing his stomach, intestines, liver, and spleen to travel up into his chest cavity. His chance of survival was slim. Corbin was placed on an Extracorporeal Membrane Oxygenation (ECMO) machine that was purchased by Children’s Miracle Network. ECMO served as Corbin’s heart and lungs, and without it, he would not have survived a flight to the next available hospital. Today, Corbin is doing great! He loves baseball, WWE and sushi! Meet Joseph. He's a miracle. Joseph is a superhero who overcame countless odds and wishes to top it all off by being able to fly like a superhero. Yet Joseph also NEEDS a superhero, a superhero like YOU! Joseph was born in 2007, just a few days before Christmas. He was 13 weeks premature and weighed 1 pound, 14 ounces. Doctors at Penn State Children’s Hospital soon realized he had developed bacteria that perforated his intestines. After his second surgery, Joseph was left with just 20 percent of his intestines. He spent four months in the Neonatal Intensive Care Unit and received nutrition through his veins for more than two years. He developed chronic lung disease and has battled pneumonia 15 times. Joseph was placed on the pancreas, liver and intestinal transplant list, but is no longer on the list because his health has improved. Despite his health challenges, his mom Noemi says her son is the happiest child you will ever meet. Noemi is thankful for the NICU incubators that Children’s Miracle Network purchased and for the wonderful support she received from the hospital’s Family-Centered care program. She is also grateful for people like YOU who helped make all those things possible, one donation at a time. 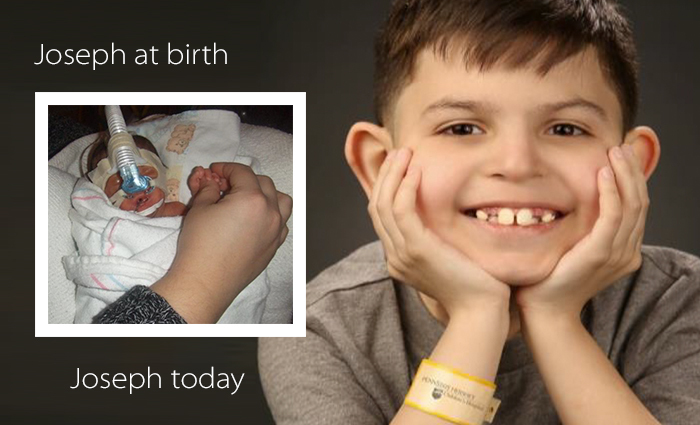 You can learn more about Joseph and meet other miracle children by visitng PennStateHersheyCMN.org. Meet Madeline. She's a miracle. Life can change in an instant. It certainly did for Miss Madeline. On October 27, 2015 Madeline’s babysitter accidentally forgot to put Madeline in the car and backed the car over her. Madeline was flown by Life Lion to Penn State Children’s Hospital where she was diagnosed with lacerations to her lungs, kidney, and liver and multiple pelvic and foot fractures. She spent eight days in our Pediatric Intensive Care Unit. After just a few days at home, she was readmitted for an infection and needed a chest tube placed to receive antibiotics. Today, Madeline is doing well! She can walk again, although she has a slight limp that will hopefully go away over time. She loves playing baby dolls with her sister Abby and watching Mickey Mouse Clubhouse. Madeline’s family is grateful for the wonderful care she received. She’s proof that accidents happen, but so do miracles! Children’s Miracle Network funds support equipment, research, and programs to help kids like Madeline have every chance for a miracle. Thank you! Meet Madison. She's a miracle. Madison was born in January 2005. At Madison’s one-week check-up, doctors heard a heart murmor and referred her to Penn State Children’s Hospital. Over the next year, doctors discovered not one, but three heart defects, including a Cor Triatriaum, an extremely rare defect that caused a membrane to grow over Madison’s left heart chamber. Madison underwent a successful heart surgery, but the following year, doctors realized her left lung had a low blood supply due to an additional defect. Fortunately, doctors were able to help Madison recover from her heart and lung conditions. Madison needs regular check-ups, but is doing quite well. She loves cheerleading, school, riding her four wheeler, swimming, and camping. Madison’s family is very thankful for Children’s Miracle Network for providing funds to purchase equipment for the Children’s Heart Group at Penn State Children’s Hospital. 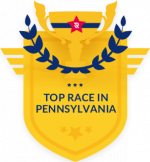 Blizzard Run is a fundraiser for kids at Penn State Children's Hospital in partnership with Children's Miracle Network hosted by DQ Grill & Chill on Roosevelt Ave in York, PA. Every dime we raise stays local and helps kids in Central PA.